Explanation: Why do some sand dunes on Titan appear backwards? Central Titan, it turns out, is covered by sand, some of which appears strange. Images from the Cassini spacecraft currently orbiting Saturn have uncovered long rows of huge sand dunes near Titan's equator that rise as high as 300 meters. Shadows indicate that most dune shapes are created by wind blowing from the west. The problem is, the typical wind at Titan's equator blows from the east. One recent hypothesis that might solve this grainy conundrum posits that the only winds strong enough to move sand and create dunes occur during rare equinoxes and blow strongly from the west. 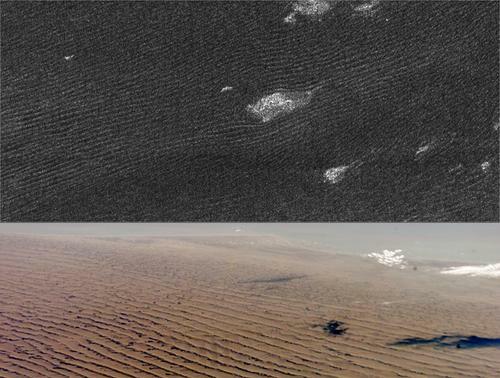 The above images show a radar swath of Titan's equatorial sand dunes at the top, while similar sand dunes that formed in Namibia on Earth at the bottom. Why central Titan is even covered by so much sand is still being investigated.